Dalhousie's Psychology and Neuroscience graduate programs place a strong emphasis on research and can be best described as "apprenticeship" programs. 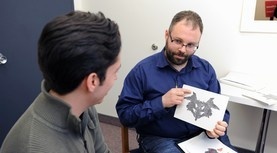 At both the master's and doctoral levels, students work with faculty members, who supervise each student's research. Research strength and independent, critical thinking are the hallmarks of our students, graduates and faculty. We are commiitted to building and sharing knowledge in the fields of psychology and neuroscience. Explore our MSc Psychology program. Explore our PhD Psychology program. Explore our PhD Clinical Psychology program. Explore our MSc Psychology/Neuroscience program. Explore our PhD Psychology/Neuroscience program.